I decided a little while ago that when it came time for me to re-polish my nails, I was going to try something new and a little more vintage. I always have my nails painted, it's very rare that you will see me without polish on. I really feel it is my best accessory. Plus, after years of acrylic nails in high school, it helps keep my nails strong and less prone to breakage. 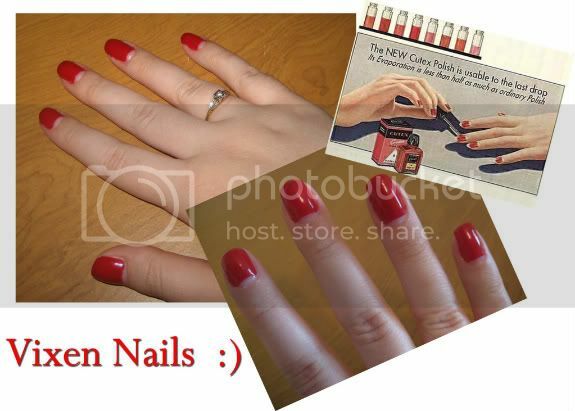 After much thought, I chose to go with a half moon manicure that many ladies sported in the 30s and 40s. I opted not to shape my nails in an almond or oval shape because I don't find it that flattering on my hands and I also chose not to do a white tip. It was really simple to do, surprisingly. Especially since I haven't ever had much luck with trying to do a French manicure at home. I used the French manicure tips at the base of my nail and did pretty much the same thing Super Kawaii Mama does in her youtube video, which you will find below. I'd like to point out that I have seen some girls use these Avery reinforcement labels instead of the manicure tips. I think this is a great idea and a much cheaper device to achieve the same look. I know what I will be buying once my tips run out! I also want to share one of my secrets for keeping nails strong and helping your polish last for more than just a few days. As I mentioned above, I used to have acrylic nails and had then on for about seven years. Two years ago, I decided enough was enough and I went back to a more natural look. It has really taken all two years to get my nails back to a somewhat normal state. Note to self: sometimes our mothers are right! Anyways, I had been having a really hard time keeping the polish adhered to my nails. After only a day or two of painting, the polish would peel right off. I knew I needed a better base coat and after several trials and errors, I believe I have found one of the best ones on the market and one that is actually affordable. ULTA's Silk Wrap Base Coat is seriously AMAZING!!! It's under $7 and definitely does what it says it will do. I can go about a week without having to redo my nails, which is considerably longer than just a day or two. So ladies if you are having the same problem as I was, take note, and go get your self a bottle of this magic potion! Awesome! Very lovely nails, I have never tried this style. Actually, I rarely have polish on my fingernails because of the problem of it peeling off too quickly and chipping, so I will be trying the Ulta Product for sure! Thanks for the tip! thanks for the advice! I love to do a half moon mani but my nails chip and peel SO easily! I'll pick up some of that stuff next time I'm out! Yuk yuk. Well at least it's Friday.